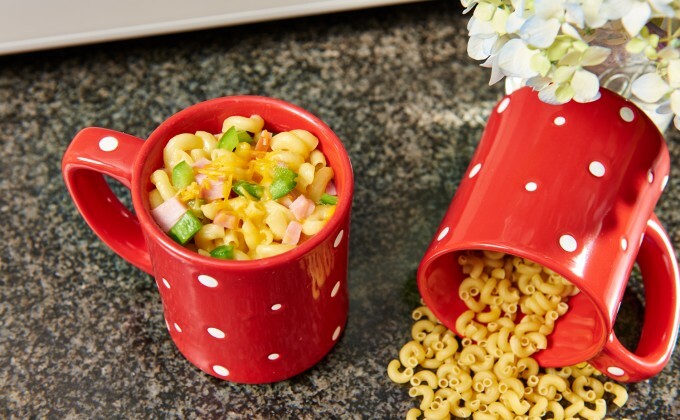 Place macaroni in your 16 ounce temp-tations® mug. Pour water over the top until the mug is 3/4 full. Microwave for 5 minutes, splitting up the time into 1-minute increments. After each 1-minute increment check to make sure water is not boiling over. All water should be absorbed by the pasta before moving onto the next step. Carefully remove hot mug from microwave and stir in milk and cheese. Return to microwave for one more minute. Top with Canadian bacon, bell pepper and a sprinkle of cheese if desired.